Toyota Prius c; Credit: © 2011 Toyota Motor Sales, U.S.A., Inc.
A cheaper, smaller version of the green hybrid electric Toyota Prius car is being unveiled in America in January 2012. The economic Toyota Prius c will make its debut at the North American International Auto Show in the city of Detroit event. The entry-level compact vehicle is designed to appeal to young shoppers who are keen to take advantage of its frugal fuel economy of more than 50 miles per gallon even in the city, which is the highest of any non plug-in vehicle. The other members of the Prius family are the new mid-sized Prius v, the Plug-in Hybrid and the third generation Prius Liftback. As well as outstanding fuel economy, the five-door Prius c includes high-spec electronics, effective aerodynamics and a sporty and uncluttered design. Hands-free Bluetooth phone services, nine airbags and audio contols on the steering wheel are all supplied as standard. The multimedia Toyota Entune system, in conjuction with a smartphone, allows owners to receive up-to-the-minute entertainment, information and navigation services, as well as the latest apps. For instance, they can receive live traffic and weather reports, petrol price updates and financial and sports news. 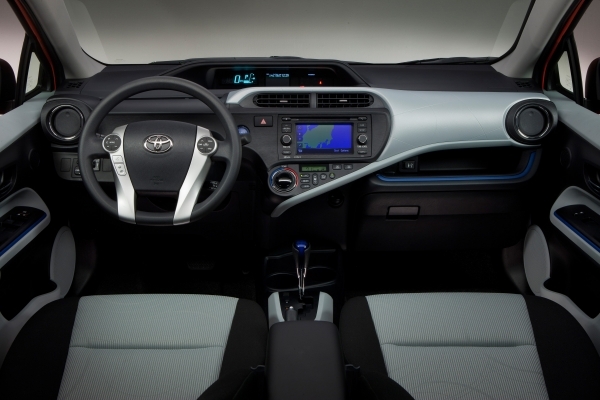 Toyota Prius c interior with multimedia Toyota Entune system; Credit: © 2011 Toyota Motor Sales, U.S.A., Inc.
Also available are voice recognition services, email and text converted to speech and music streaming services. Through Entune, owners can choose from a huge selection of more than 750 radio stations and personalised playlists through website radio stations. Additional satellite radio stations can also be received. Music favourites from iPods and other portable media players can also be enjoyed thanks to streaming via Bluetooth or USB connections. The Prius c is 157.3 inches long, 66.7 inches wide and 56.9 inches high, with a wheelbase of just over 100 inches. It is powered by a 1.5 litre Double OverHead Camshaft (DOHC) four-cylinder, 16-valve petrol engine with Variable Value Timing - Intelligent (VVT-i). The other Prius models have 1.8litre engines. Hybrid electric vehicles combine a conventional engine with an electric propulsion system. The exact price of the Prius c has not yet been confirmed, although it will be cheaper than the other Prius models.